Microsoft Excel is considered the most common BI reporting and analysis tool by many organizations. Business Managers and Analysts can connect it to HANA database to draw Pivot tables and charts for analysis. Open Excel and go to Data tab → from other sources → click on Data connection wizard → Other/ Advanced and click on Next → Data link properties will open. 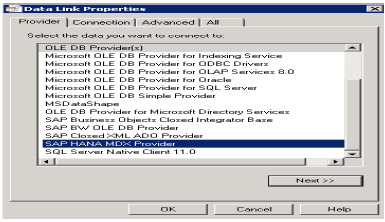 Choose SAP HANA MDX Provider from this list to connect to any MDX data source → Enter HANA system details (server name, instance, user name and password) → click on Test Connection → Connection succeeded → OK. It will give you the list of all packages in drop down list that are available in HANA system. You can choose an Information view → click Next → Select Pivot table/others → OK.
All attributes from Information view will be added to MS Excel. You can choose different attributes and measures to report as shown and you can choose different charts like pie charts and bar charts from design option at the top.